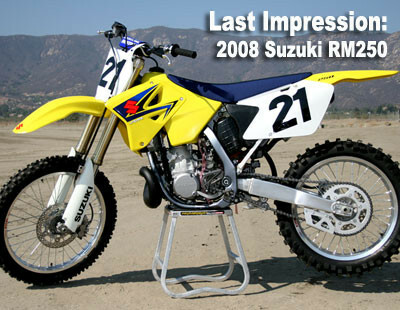 In 1975, the RM (racing machine) was introduced to the world, and the year 2008 brings us the last of the RM250 two-strokes. In most situations this article would be a first impression ride, but sadly this is our last introductory ride on the quarter liter machine, thus being our "last impression." What has becoming commonplace among the manufacturers is the ceasing of production of the two-stroke. With Suzuki now a part of the group stopping the production of the RM250, it is just another nail in the coffin for the two-stroke. Vital MX invited pro Turbo Reif to come out and give the Suzuki one last test for us, and he was not disappointed. Was he disappointed that another two stroke machine is being put to rest? Yes he was. Was he disappointed in what the RM250 is still capable of? No, he was not. At the track, it was very easy to hear the familiar "braap" as Turbo put the bike through its paces, and it will be a sound that will be dearly missed by many. If you want to hear the sweet sounds of a two-stroke and also see it on video, ridden the way the way it was meant to, click here for one more trip down memory lane. What is new to the bike this year? Well, what would a new bike be without “Bold New Graphics!” This year the bike also comes with Renthal aluminum tapered handlebars and a Renthal bar pad. Below you will find a breakdown of all of the other RM250 features. 249cc, 2-stroke, liquid-cooled engine with a bore and stroke of 66.4mm x 72.0mm provides crisp, responsive power. Electric CDI is efficient and increases power output at lower rpm ranges..
Strong and lightweight frame and easy-to-remove aluminum rear subframe improve rigidity and performance on the racetrack. SHOWA inverted 47mm front forks provide 310mm (12.3 inches) of front wheel travel. With fully adjustable for compression damping, rebound damping and spring preload to suit variety of riders. Piggyback-reservoir rear shock absorber is fully adjustable for high, low, rebound damping and spring preload SHOWA unit that offers 310mm (12.2 inches) of wheel travel. Renthal aluminum tapered handlebars with Renthal handlebar pad reduce vibration reaching to the rider.